We're the kind of family who love walking along the beach making plans for the future. For many years it was our time to dream of impossible adventures, seemingly well outside our reach and when we saw a yacht on the horizon all we could do was to wish for a miracle. In the 9 years we owned her, she served duty as a liveaboard home, a passagemaker and a magic carpet on which we saw the world. From the first sail out of Hong Kong harbour as confident novices to our arrival back in Sydney after a circumnavigation 6 years later as wiser and humbled novices we gradually learned what we wanted to do with our lives. Our experiences on that journey lead to a collection of ideas on the cruising life that became the seed for our concepts of our ideal cruising yacht, of our version of long-term living aboard and to the ultimate devotion to the cause - the task of building illywhacker, our floating home. This website tries to span the Dulcinea years as well as serving as a record of our adventures aboard illywhacker as they happen. We try to update the web diary as we go along while more detailed stories and photos have to wait until we are "connected" to land and the internet. Web pages of past narratives require that we are back at homebase where the archives are stored with our long-suffering family. 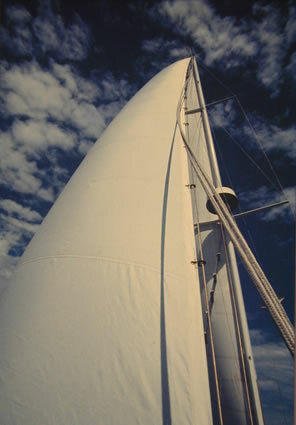 Following the realisation that Lyndall was suffering from a serious health problem, we sailed illywhacker from Canada to Townsville, Australia, arriving in September 2003. While we resolve this issue a few land trips and coastal Australian adventures will find their way on to this website. We hope that cruising sailors from Australia and oveseas will still be able to find useful information on new places to visit to further their cruising adventures.